After the introduction of vacuum firing of dental porcelain (1940) and especially after the realization of the connection metal – porcelain (S. Brecker, 1956), the metal-ceramic restorations gradually turned into a standard for aesthetic restorations. 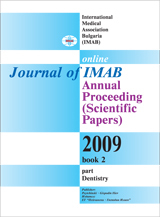 The dentists’ aspiration for satisfying the increasingly raising aesthetic and functional demands of the patients led to the development of new laboratory technologies. Captek is unique in its nature technology for producing of metal-ceramic restorations. Ceramic is laid over a gold-platinum-palladium frame, that is not cast. Key words: Captek, gingival health.